You can order through our website or over the phone. Once we receive your order, we will contact you to ask you some questions about your building. We will then send you a copy of your order form, where you can check over all details. The price includes VAT, erection, felting and a base coat of treatment. 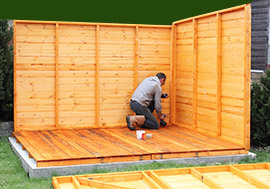 How are your sheds constructed? What type of timber do you use? The three types of cladding we use are machined from kiln-dried, graded Scandinavian redwood. The timber is cut from sustainable, managed forests, meaning we’re environmentally friendly. Overlap is a 150mm rough sawn board, 19mm thick at one edge tapering down to 6mm, with every board overlapping by 25mm. Then we have our tongue-and-grooved 16x125mm Scandinavian redwood kiln-dried board. And lastly we have a 22x125mm Scandinavian redwood kiln-dried half-round loglap board. Our framework is 38’×50′, 47’×47′ or 47’×75′ planed timber, depending on model. Floors and roofs are constructed from 11mm OSB 3 boards or tongue-and-grooved boards. The roof is covered with green mineral felt. If you have any queries about our materials, please get in touch and we can advise which material is best for your needs. Can you make any size or shape to order? Yes, we will manufacture any size or style to your specification. What type of base do I require? You need a firm, level base consisting of a gravel and timber bearers, patio slabs or timber bearers. Please phone us for advice regarding this. Where are your buildings manufactured? We manufacture all our buildings at our workshops in Llanelli. Our show site is also at this base. Normally between 7 days and 4 weeks, depending on current stock. After an order is place we shall contact you regarding a delivery date.